The Auxiliary of the Ontario Association of Fire Chiefs was established in 1970 by a group of wives of Ontario Fire Chiefs, the objective being to promote friendship among the members and to be of any assistance to the Ontario Association of Fire Chiefs that might be required. friendship remains, today we are a non-profit group, raising money annually for Muscular Dystrophy and Camp Bucko (Burn Camp for Kids of Ontario). Over the past 34 years the OAFC Auxiliary has raised many thousands of dollars for these charities. Membership in the OAFC Auxiliary is $20.00 annually. At the Annual Meeting all members in good standing may make a motion from the floor and take part in any vote. Only members who are spouses or partners of Active members of the Ontario Association of Fire Chiefs are eligible to be elected as an Officer of the OAFC Auxiliary Executive. May 3rd to 6th 2018, marks the 66th OAFC conference and trade show in Toronto. The OAFC has been working hard to revamp the format of this event. The companion programs’ social events are once again being offered by the Ontario Association of Fire Chiefs. Information regarding the Companions’ Program opportunities may be found by clicking the link below. Please be sure to register for the Companion’s Program through the OAFC website as soon as possible. Due to booking logistics pre-registration is preferred. After much consideration of the new format and schedule, the annual meeting for the OAFC Auxiliary will take place on Friday May 4th, 2018, at the host hotel. Members can register from 9am to 9:30am before the meeting. We will have our draw tables set up to raise funds for our chosen charities at the Annual Meeting – all prize donations are greatly appreciated and can be brought to the Annual Meeting on Friday morning. You will be given time to buy tickets for a chance to win something from the wide arrangement of gifts that are brought in. New members are always welcome. Networking "FUN" Raising Night in support of the CFFF - 8pm to 12am. Members are encouraged to continue their fundraising efforts for Camp BUCKO. We understand just how much each and every donation means to this organization. We hope you will join us in the planned events and enjoy reconnecting with each other. If you have any questions, please feel free to email Debbie at ddonovan@rona.ca or Darlene at loos_d@hotmail.com. The Executive of the Auxiliary invites you to participate with the OAFC Auxiliary and Companions’ Program being offered in conjunction with the Ontario Association of Fire Chiefs 65th Annual Conference and Trade Show. The conference is being held in Toronto May 6-May 10, 2017. The social outings are now being offered by the Ontario Association of Fire Chiefs. The Companions’ Program opportunities may be found by clicking the link below. Please be sure to register for the excursions by April 28th. www.oafc.on.ca/event/oafc-2017-conference-companions-excursions. Due to booking logistics, late registrations cannot be accepted. In 1970 the Auxiliary was formed and remains an opportunity to promote friendship and raise money for some very deserving charities – Muscular Dystrophy and Camp BUCKO. The Burn Camp for Kids in Ontario takes place annually and costs nearly $2000 per child for a week at the camp. Money raised during the conference supports this very worthy charity and your donations are greatly appreciated. Members of the Auxiliary are welcome to participate in the Annual Meeting being held on Tuesday, May 9th at the Toronto Congress Centre beginning at 9:00am. All companions are welcome to join the Auxiliary. A quick reminder-we will have our draw tables set up to raise funds for our chosen charities at the Annual Meeting – all prize donations are greatly appreciated and can be brought to the Annual Meeting on Tuesday morning. You will be given time to buy tickets for a chance to win something from the wide arrangement of gifts that are brought in. This is a fun draw-what better way to raise money? If you have a larger item for the silent auction table, please bring to the conference centre and we will have a table set up on Sunday afternoon outside of the trade show. We will do the silent auction draw at the banquet on Monday night. 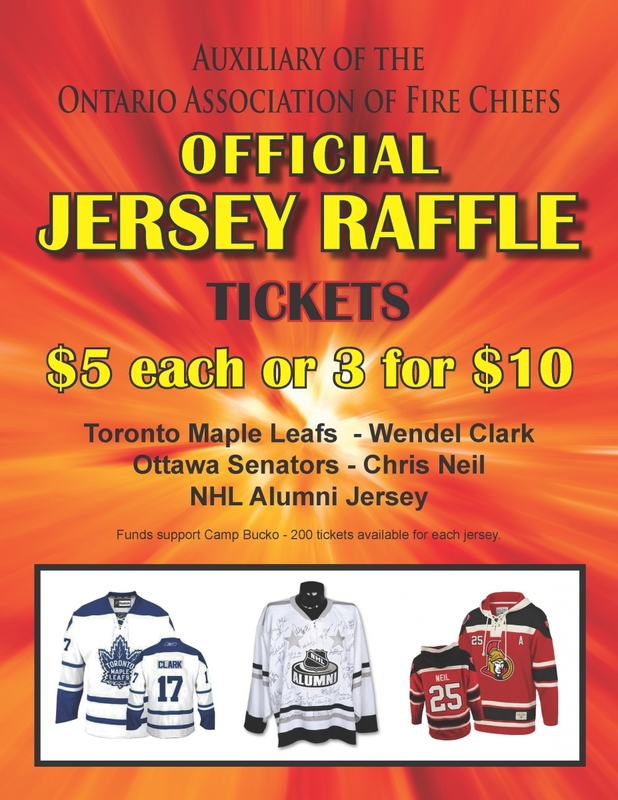 We will also have tickets available this year to try to win 3 NHL Jersey’s. Finally, please remember to bring in your Canadian Tire money so we can present these funds to the Camp BUCKO crew. Membership must be current to vote in the Annual Meeting and may be paid at our registration, which will be open on Sunday, May 7th from 3:00pm-4:00pm and just prior to the meeting on Tuesday May 9th from 8:00-9:00 a.m. At the Annual Meeting, all members in good standing may make a motion from the floor and take part in any vote. Lunch follows in the same meeting room. We have invited Camp BUCKO representatives to attend our meeting again this year. We hope you will join us for the excursions and the Annual General Meeting. The Auxiliary is a great way to meet new friends and get the most out of the conference all while raising money for some very deserving charities. If you have any questions, please feel free to email me at wpsh5@hotmail.com or call 519-326-5507 or 519-324-7236. The Executive of the Auxiliary invites you to participate with the OAFC Auxiliary and Companions’ Program being offered in conjunction with the OAFC 2016 – The Ontario Association of Fire Chiefs 64th Annual Conference and Trade Show. The conference is being held in Toronto April 30th –May 4th. The Auxiliary was formed in 1970 and remains an opportunity to promote friendship and raise money for some very deserving charities – Muscular Dystrophy and Camp BUCKO. Members of the Auxiliary are welcome to participate in the Annual Meeting being held on Tuesday, May 3rd at the Toronto Congress Centre in the McKennitt Room 5/6. All companions are welcome to join the Auxiliary. Membership is $20.00 per person and is in addition to any fees paid for your conference attendance. Please note the meeting date has been changed to Tuesday to encourage more participation. Membership must be current to vote in the Annual Meeting and may be paid at our registration, which will be open on Sunday, May 1st from 3:00pm-4:00pm and just prior to the meeting on May 3rd from 8:00-9:00 a.m. At the Annual Meeting, all members in good standing may make a motion from the floor and take part in any vote. Only members who are spouses or partners of active members of the Ontario Association of Fire Chiefs are eligible to be elected as Officers of the Executive. Lunch follows in the same meeting room. Our guest speaker, Jerry Austin with the Kitchener Fire Department, will be speaking on Critical Incident Stress; a topic that has affected all partners. We also have requested the Camp BUCKO representatives attend this meeting as well. The Auxiliary will again present a draw and Silent Auction to raise money for our favourite charities – Muscular Dystrophy and Camp BUCKO. The Burn Camp for Kids in Ontario takes place annually and costs nearly $2000 per child for a week at the camp. Money raised during the conference supports this very worthy charity and your donations are greatly appreciated. Thank you to all members who have generously donated to the camp in the past. A quick reminder-we will have our tables set up to raise funds for the four different charities at our Annual Meeting – please bring a gift for each table and you can buy tickets and try to win the wide arrangement of gifts that are brought in. This is a fun draw - what better way to raise money? Please bring your gifts in on Tuesday morning. Also if you have a larger item for the silent auction table, please bring to the conference centre and we will have a table set up on Sunday afternoon. We will do the silent auction draw at the fun night. Finally, please remember to bring in your Canadian Tire money so we can present these funds to the Camp BUCKO crew. Clause 1 of the Constitution amended to say that the objective is to promote friendship among the members and fundraise for our adopted charities – Camp BUCKO and MD. Removal of “Assistance to the Chiefs as required”. Clause 3 to be amended to reflect Executive proposed above. Clause 4 Duties – all to give notice to Secretary if they can’t attend the meetings, all take part in fundraising activities at the Conference and all form the Welcoming Committee. President remains the same, Vice-President (former 1 VP) remains the same, Secretary – same, Treasurer – add that this position is one of the signatures on the cheques, Directors at Large – assist Secretary and Treasurer with registration, assume any role should another exec not be able to attend (ie step into Secretary role or VP) VP would always step in first if President not available. Clause 8 - Instead of finances being audited by two members chosen at previous conference, simply two members present. The Executive of the Ladies’ Auxiliary invites you to participate with the Auxiliary and Companions’ Program being offered in conjunction with the 62nd Ontario Association of Fire Chiefs’ Annual Meeting and Educational Seminar. The conference is being held in Toronto May 3-7, 2014. The Ladies’ Auxiliary was formed in 1970 and remains an opportunity to promote friendship and raise money for some very deserving charities – Muscular Dystrophy and Camp BUCKO. Members of the Auxiliary are welcome to participate in the Annual Meeting being held on Monday, May 5 at the Toronto Congress Centre. The meeting begins at 9:30 a.m., followed by lunch. Please note that membership in the Ladies’ Auxiliary is $20.00 per person ($15 for Life Members) and is in addition to any fees paid for your conference attendance. Membership must be current to vote in the Annual Meeting and may be paid at our registration, which will be open on Sunday, May 4 from 15:00 until 16:00 hours and just prior to the meeting on May 5 from 8:30-9:30 a.m. At the Annual Meeting all members in good standing may make a motion from the floor and take part in any vote. Only members who are spouses or partners of Active members of the Ontario Association of Fire Chiefs are eligible to be elected as Officers of the Executive. In 2014 the membership will be asked to vote on changes to the By-laws and Constitution, which are posted online at www.oafc.on.ca/ladies-auxiliary for your review. Perhaps the most interesting change to note is the proposed change in name from Ladies’ Auxiliary, Ontario Association of Fire Chiefs to Ontario Association of Fire Chiefs Auxiliary to be more inclusive. Our Special Guest Speaker this year is Kingsville’s Fire Chief Bob Kissner. The Auxiliary will again present a draw and Silent Auction to raise money for our favourite charities – Muscular Dystrophy and Camp BUCKO. The Burn Camp for Kids in Ontario takes place annually and costs nearly $2000 per child for a week at the camp. Money raised during the conference supports this very worthy charity and your donations are greatly appreciated. You may bring the item(s) for the draw and any additional donations of hats, shirts, etc. with you to registration on Sunday. Anyone who so chooses, is welcome to attend the Monday meeting to personally hand over their donations to the representatives of Camp Bucko. Thank you to all members who have generously donated to the camp in the past. You are an inspiration to us all and to the kids that attend the camp. We have the good news that Mark from M&L Supply is sponsoring our lunch on Monday. A huge THANK YOU to Mark. We also need volunteers to help with ticket sales for our big draw. We are starting to sell on Sat. morning and I will be doing that and possibly Sun. am as well. It would be nice to have a few volunteers to relieve. We do hope you will join us. The Auxiliary is a great way to meet new friends, get the most out of the conference and raise money for some very deserving charities. Information regarding the Ladies Auxiliary Program in conjunction with the 61st Annual Ontario Association of Fire Chiefs Conference is now available. The Conference is at the DoubleTree Toronto Airport Hotel from May 4-8, 2013. We look forward to seeing you there! This is a sample Camp Bucko letter that can be used for fundraising purposes.